People with deadly heart conditions are mistakenly being diagnosed with stress, research suggests. An estimated 620,000 people in Britain are living with genetically inherited heart problems - yet the vast majority have no idea they are at risk. The genetic disorders can go completely undetected until someone’s heart suddenly stops beating. New polling by the British Heart Foundation suggests six in ten patients living with inherited heart conditions have their symptoms attributed to other conditions before doctors realise what is wrong with them. Some 23 per cent of those who were not immediately diagnosed were told they were suffering with stress or anxiety, 7 per cent were wrongly old they had asthma 5 per cent were diagnosed with epilepsy. Some 54 per cent had to wait more than two years before they were finally diagnosed with a heart condition, the poll of 370 people with genetic heart conditions revealed. At least 624 people are thought to die each year from sudden cardiac death - but this figure is considered the tip of the iceberg, with many other deaths mistakenly put down to other causes. 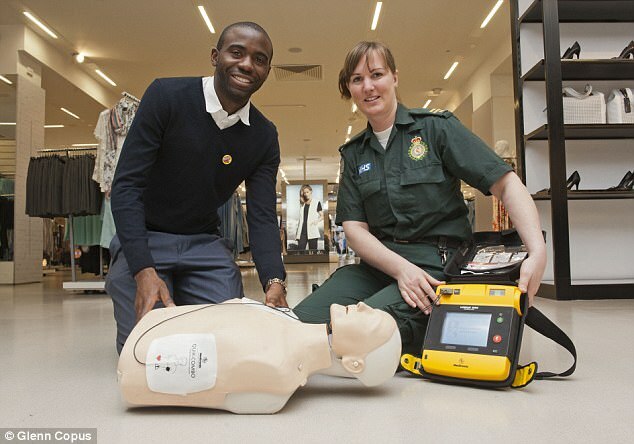 Premier League footballer Fabrice Muamba collapsed with such a condition in 2012, aged just 23, his heart stopping for 78 minutes. He later recovered and was diagnosed with hypertrophic cardiomyopathy - one of a list of heart conditions caused by genetic factors. Some of these inherited conditions give people a weak heart muscle, so blood is not pumped properly around the body, while others cause an abnormal heart rhythm, which means the heart could suddenly stop beating. Other forms mean patients have abnormally high levels of cholesterol, increasing their risk of dying from a heart attack by 100-fold. In April 2015, England cricketer James Taylor was forced to retire at the age of 26 due to arrhythmogenic right ventricular arrhythmia - a rare condition which meant the right side of the heart was out of sync. And Miles Frost, the eldest son of broadcaster Sir David Frost, collapsed and died at the age of 31 in 2015. He was diagnosed with hypertrophic cardiomyopathy. Sir David, who had died from a heart attack two years previously, aged 74, had the same condition, but his son was never told he might have inherited it. Children have a 50 per cent chance of inheriting the faulty gene from a parent who has it. Dr Mike Knapton, associate medical director at the British Heart Foundation, said: ‘Inherited heart conditions can be silent killers. This means that early diagnosis is essential so people can be put on the right treatment and live a normal life. ‘These results show that it can be extremely difficult to correctly diagnose people, meaning it’s vital that we raise awareness about the symptoms and diagnostic tests for those most at risk of inherited heart conditions. The charity is calling for medical professionals and patients to be made more aware of the signs of these deadly conditions, and is calling and for more research in to identifying the genetic faults responsible. While genetic testing for families at risk can help diagnose some of these conditions, many of the genes responsible remain a mystery.